Please contact the Credit Union for current Dividend and Loan rates. Save an average of $385* on your auto insurance with Farmers Insurance Hawaii. 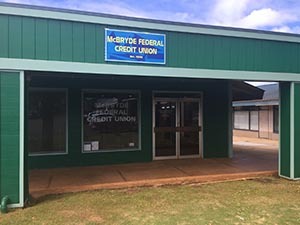 Call them today for your McBryde FCU member discount, including savings on homeowner’s insurance and local claims service. Visit Farmers Insurance Hawaii or call (800) 515-1023. *Average savings from information provided by new policyholders from 6/1/17 to 6/1/18 which showed that they saved by switching to Farmers Hawaii. Lives in the communities of Eleele or Hanapepe. Regularly works, attends school, worships or performs volunteer services in the communities of Eleele and Hanapepe. Is an immediate family member of an existing member or in the same household of an existing member (Immediate family members are defined as a spouse, parent, child, sibling, grandparent or grandchild).